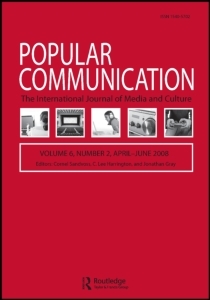 Dr. Geoffrey Baym has co-edited (along with Jeffrey P. Jones from Old Dominion University) a special double issue of the journal Popular Communication: The International Journal of Media and Culture. The issue focuses on news parody and political satire programs (like The Daily Show) from all over the world. The collection features essays about parody shows from 13 different countries, as diverse as the US and the UK, to Italy, Iran, and India. The journal will be in print in February.